There's no denying that the big green guy has always been an integral part of Marvel comic books, but in this The Incredible Hulk slot review, you'll find out that he can bring you some huge prizes, too. 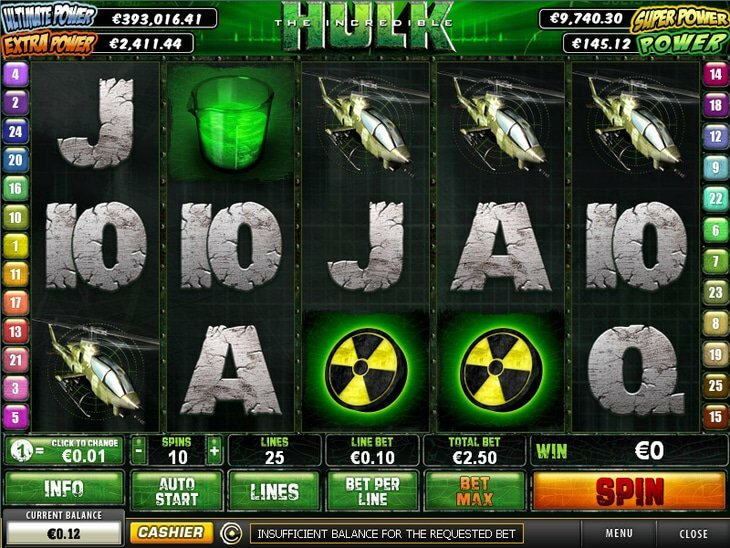 This is a five-reel, 25-payline option from Playtech that features the Hulk in all of his glory. As you'd expect, the background is green and black to offset the symbols found in each square. These include radioactivity symbols, police cars, helicopters and more all made a bit more interesting with the poker numbers 9 through Ace carved out of stone surrounding them. There's not only a nice in-game jackpot of up to $200,000, but you'll also be privy to the randomly-triggered progressive jackpot that is available in four different tiers depending upon the size of your per-spin wager. To determine this amount, you'll get to choose from coin values starting at a penny and climbing to $1 and then choose to wager anywhere from one to 10 coins on each of the 25 paylines! That's a whopping maximum of $1,250 per spin for those who really like to take some risks. The Hulk himself is wild and he can complete wins by acting as any regular icon in the game. If he appears in the middle of the center reel or on two, three and four simultaneously, he'll expand to fill all of the positions and really rack up the wins! However, the Hulk Smash Bonus round is where the fun really begins. In it, you'll choose three police cars to smash for instant prizes. However, you can also trigger the Rage feature in which all seven prizes are revealed at once. Afterwards, you'll select a helicopter which will provide you with your multiplier; everything you've accumulated will be added to your balance once the feature ends. Finally, there is a scatter in the form of the Title Logo which will trigger 10 free spins during which all of your prizes are tripled. This occurs any time you see three or more Title Logos anywhere on your screen. The progressive jackpot is triggered randomly so if you are chosen to participate, you'll be taken to a screen with 20 boxes. The goal is to keep opening them until you've collected three of the same image; when the image is compared to the pay table, this will tell you which level of the four 'Power' prizes that you've won.